Cost-effective chemical and abrasion resistance for high-tonnage abrasive piping applications. Rubber & Ceramic-Lined Pipes from Corrosion Engineering utilize advanced rubber and ceramic technologies to offer unsurpassed levels of resistance to wear, abrasion, impact, and erosion for highly aggressive slurries. Corrosion Engineering’s rubber and ceramic-lined pipeline systems are cost-effective solutions to high-tonnage abrasive piping applications. Our unique technologies and top-performing materials allow us to provide exceptional resistance to severe wear, abrasion, corrosion, and erosion for abrasive slurry applications. No matter the conditions of the application, Corrosion Engineering abrasion-resistant piping systems offer optimal wear characteristics to extend wear life and minimize maintenance. Our rubber and ceramic-lined piping outperforms traditional piping and piping lined with alternative rubber, coatings, ceramics, and other materials. We blend custom elastomers to provide resistance to chemicals such as acids, hydrocarbons, and alkalis. 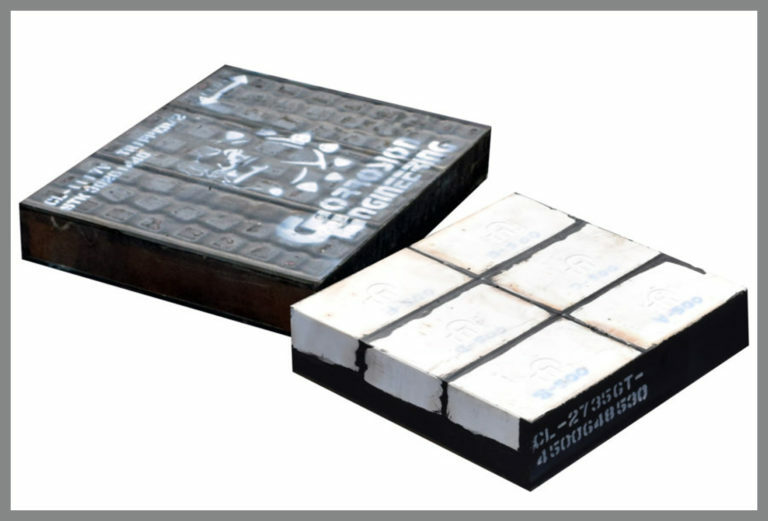 Our standard lining material consists of a unique and highly energy-absorbing proprietary rubber compound bonded to a special ceramic exclusively developed for abrasive slurries. Utilizing proprietary surface treatments and unique fabrication technologies, we ensure optimal bond strength between all components. Corrosion’s pipe systems offer exceptional levels of resistance to abrasion, corrosion, and erosion without the brittleness typically associated with traditional ceramics. This, coupled with the ideal bond strength, eliminates the chances of the lining falling out and being caught downstream. We have developed ceramic compounds exclusively for use in abrasive slurry applications. This material is one of the hardest known to man and is ideal for wear applications where corrosion and abrasion is present. Our pipe ceramics are extremely cost-effective and highly recommended in applications that are especially aggressive. Corrosion Engineering has the expertise and capabilities of fabricating custom spools, bends, elbows, cyclones, nozzles, and other pipes to meet customer specifications. Our in-house capabilities are beneficial to minimize cost, improve turnaround, and ensure optimal performance. SUPERPIPE is comprised of ceramic tube inserts to offer a smooth, durable ceramic lining that reduces pumping cost and ensures tube-to-tube concentricity.